My cousin Dustyn passed on from this life 6 days ago. He died of a heart aneurysm, in his sleep. I hadn’t made the time to spend much time with him in the past few years. But when we were little kids, our parents made sure we got to spend some good times together. One memory I have most vivid of Dustyn includes an evening when my brothers and I, and Dustyn and our cousin Landon, were all at my Oma’s apartment, while our parents went to see Phantom of the Opera at the Denver Center For The Performing Arts..
5 growing boys stayed with Grandma for 1 evening. We not only ate the meal she prepared, but also everything else she had in her house. The TV dinners in the fridge, the crackers in the pantry, everything right down to the last piece of bread slathered with peanut butter and jelly. Dustyn had a great sense of humor and a great work ethic. I’m sorry that I didn’t make the time to spend more time with him and get to know him better as an adult. Rest In Peace Dustyn. You will be missed. 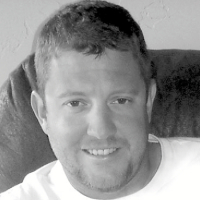 Dustyn Kraft was born in Grand Junction on August 27, 1978 and passed away November 21, 2011 of natural causes. Dustyn is sadly missed by all who knew him. He was the most remarkable father, a son who would make anyone proud, a best friend to his brother, a loving husband, and a friend many counted on in good times and bad. Dustyn and Shayla Cox were married on June 26, 2011 and welcomed their beautiful daughter, Kaylee on January 11, 2006. Shayla and Kaylee survive Dustyn. Dustyn is also survived by his brother, Landon Kraft; mother, Lorri Wesson; father, Guy Kraft; grandmother, Shirley Wesson; grandfather, Gene Kraft; numerous nieces and nephews, aunts, uncles, and cousins, and his beloved dog Rugby. He was preceded in death by his grandfather, Charles Wesson and grandmother, Hilda Smith. Dustyn lived in the Grand Junction area his entire life. He graduated from Fruita Monument High School and attended Mesa State College. His chosen work was as a General Contractor and he founded and owned Kraftsman Construction. Dustyn loved to fish, hunt, golf, and camp. After a brief period as a Raider fan he became a dedicated Denver Bronco fan. Memorial contributions may be made to The Western Rockies Federal Credit Union in C/O Kaylee Kraft. Yes… I agree with my brother Jon and am sorry that we didn’t get to spend more time with Dustyn in our later years. Dustyn was a great guy that was always so low key, trustworthy and generally just high on life making the most out of every day he was given. We will miss you Dustyn. I’m so sorry for your loss. Such a tragedy, especially leaving behind his young family. Life truly is so fragile, and this is another reminder of how precious our time here is, even if we don’t realize it every moment. Sending love and healing thoughts to you and your family. Thank-you very much for your comments and support. Life, even 100 years, is a short amount of time to do and see and enjoy all that is available to us. What we can do is live each day to the fullest, and I’m glad to know you and Peter, who absolutely make the most of each day and every friendship. I’m really looking forward to seeing your new addition very soon! I met Dustyn in 2002 when we became neighbors. He was the most helpful guy I had ever had the pleasure of meeting. It saddens my heart to hear that this happened to such a great guy. I wish I would have stayed in contact with him over the past few years, but I came to accept that life happens and people move on. Rest in peace brother.